A group of students from the Eindhoven University of Technology has an ambitious plan: to build the world’s first car powered by formic acid. They aim to have one ready as early as next year. Hydrogen cars have been around for a while. Their biggest advantage, compared to gas-powered cars, is their lack of emitting harmful substances: hydrogen cars emit water vapour and some hydrogen. Hydrogen cars have some serious disadvantages as well though, with gaseous hydrogen being expensive to store and extreme flammable. Additionally, gaseous hydrogen has to be produced somehow. Traditionally, hydrogen is produced using either methane or simply water as a source. Another option is to use formic acid. This simple acid, named after the ants (formica in Latin) that produce it, can be turned into hydrogen relatively easy. Already in 2008, German researchers described a way to do this. It was Eindhoven researcher Dr. Georgy Filonenko who discovered a way to make the production process a lot faster. By using catalysts, the process of turning formic acid into hydrogen, is now so fast it can be done inside a car. A new type of car, one that Team FAST is developing. Last year a group of students from the Eindhoven University of Technology participated in an honours project, where they were looking into useful applications for the new catalysts Dr. Filonenko discovered. They figured that this technology might find a use in the development of a car powered by formic acid. 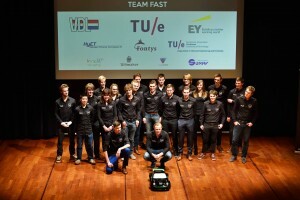 After entering a sustainability competition and winning 5000 euro with this idea, the students decided to form Team FAST: Formic Acid Sustainable Transportation. This is a promising technology and there seems to be great potential for turning this endeavour into a company, at some point. Aerts explains there are other priorities: “Right now the team wants to focus on making the technology work first, but of course we are analysing our future.” As the team is now legally a foundation, it is depending on grants and sponsoring. This means Team FAST is not making a profit, but it also means that costs are low, as no salaries have to be paid to team members. In January, Team FAST demonstrated Formauto Junior, their model-sized formic acid powered car. It slowly drove around the podium at Eindhoven University. The team plans to run tests with the formic acid technology build into a prototype city bus later this year, and after that they will focus on the development of a full-sized car. The projected range of the car will be 500 kilometres on a 100-litre tank. That’s significantly less than the range of a diesel-powered car, but more than current electrical cars and hydrogen cars. And it also comes without the emissions of diesel cars, without the dangers associated with regular hydrogen cars, and without a need to charge any batteries. According to the students of Team FAST, another benefit of using liquid formic acid instead of gaseous hydrogen, is that the existing infrastructure can be used, which is optimized for liquid fuels (gas and diesel). Formic acid, as currently used in commercial applications, is mostly made from methanol and other fossil fuels. This is also the formic acid that Team FAST is using for their experiments. It is also possible to produce formic acid by electrolysis of water followed by a reaction with carbon dioxide, but currently this method is not commercially viable. This, or other more sustainable production methods, might be used in a later stadium. When formic acid is turned into hydrogen inside the car, the by-product is carbon dioxide, the same carbon dioxide that had been used during production. Finally, in a fuel cell the hydrogen is turned into electricity which powers the car, a process which produces mainly water vapour and some hydrogen. So, when using green energy for the production of formic acid, the whole process can be emission neutral. Team FAST is also conscious about their use of materials in the production process. The Formauto Junior model car parts are printed on Ultimaker 3D printers, using Innofill3D materials made from recycled plastics. Team FAST has set the ambitious goal to have a full-sized car powered by formic acid on the market by 2017. The students’ ambitions don’t end here though. They are looking into the applications of formic acid in trucks, ships and airplanes as well. Pictures courtesy of Bart van Overbeeke. Interesting idea but there is no need for this. Blue power is way better and simpler and available for everyone.